Online graphic design tool website, Canva, empowers millions of people in over 190 countries to design anything and publish anywhere. This cloud-based service platform is a simple way to create a variety of graphics such as social media images, invitations, cards, posters, logos, flyers, and more. With over 10 million active users around the world, Canva provides its community with access to a constantly growing collection of design templates, customizable with images, colors, icons, and hundreds of fonts. Canva also features a library of more than 3 million media assets, with free elements such as illustrations, icons, and charts. 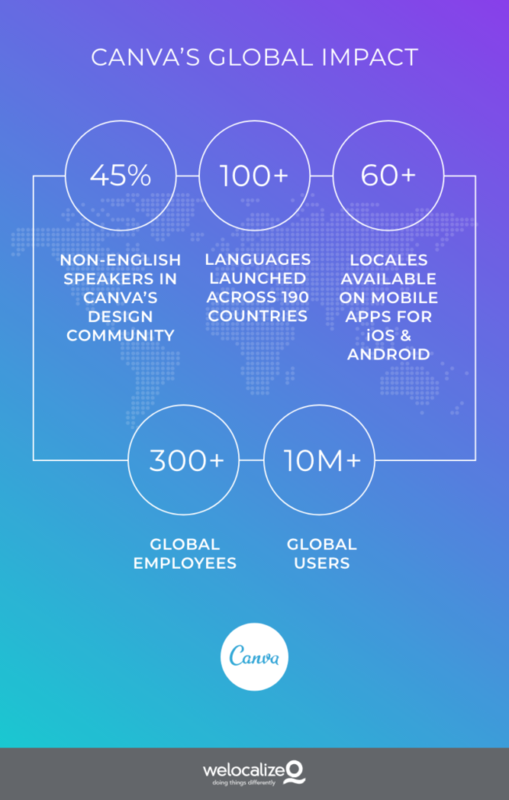 Globalization has been part of Canva’s growth strategy since the beginning—at the moment, approximately 45% of Canva’s users are non-English speakers. With big goals powering its drive for global reach, Canva aims to have the online design tool available to the world’s 3 billion internet users in their own dialect. 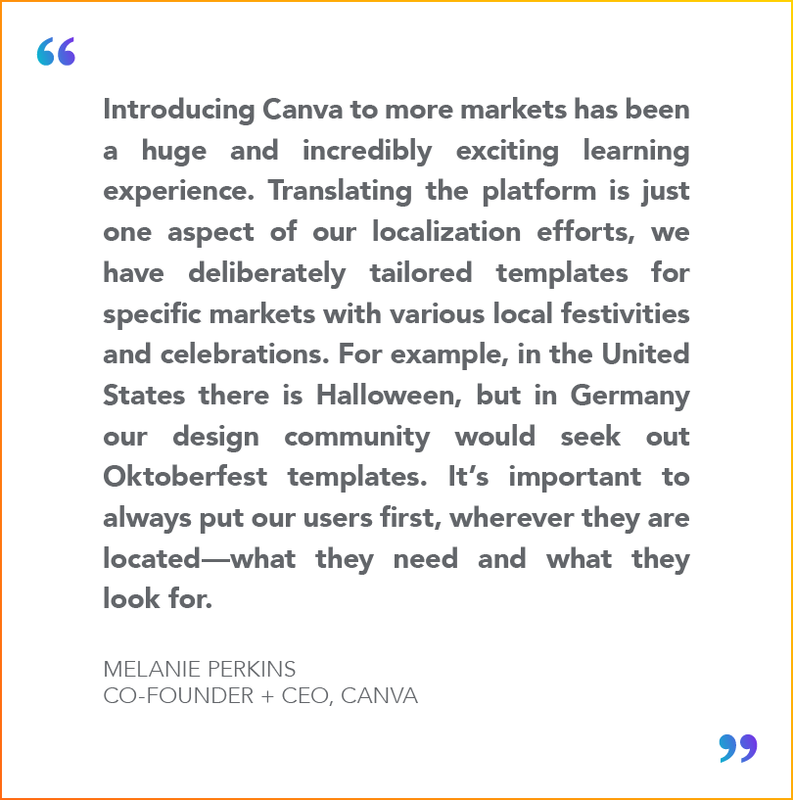 When Canva was established as a startup in 2012, founders Melanie Perkins, Cliff Obrecht, and Cameron Adams recognized the importance of delivering the cloud-based design service to users all over the world and promptly introduced translation to the business strategy. They started small, translating from English to European Spanish, but have since launched over 100 languages in 190 countries. Global reach is no small feat—Canva localizes everything they build on all platforms: the user interface (UI) of the design tool and app, the customizable templates in their library, its learning platforms and SEO digital marketing campaigns. Culturally relevant UX is key to Canva’s success. They invest in font research for language compatibility and to develop smart templates—unbreakable, structurally sound layouts that adjust to user modifications—reaching a global audience with design tools and content that resonates locally. Welocalize and Canva established their partnership in 2017, joining a global team who are responsible for launching Canva to wider audiences and driving better awareness in established markets. 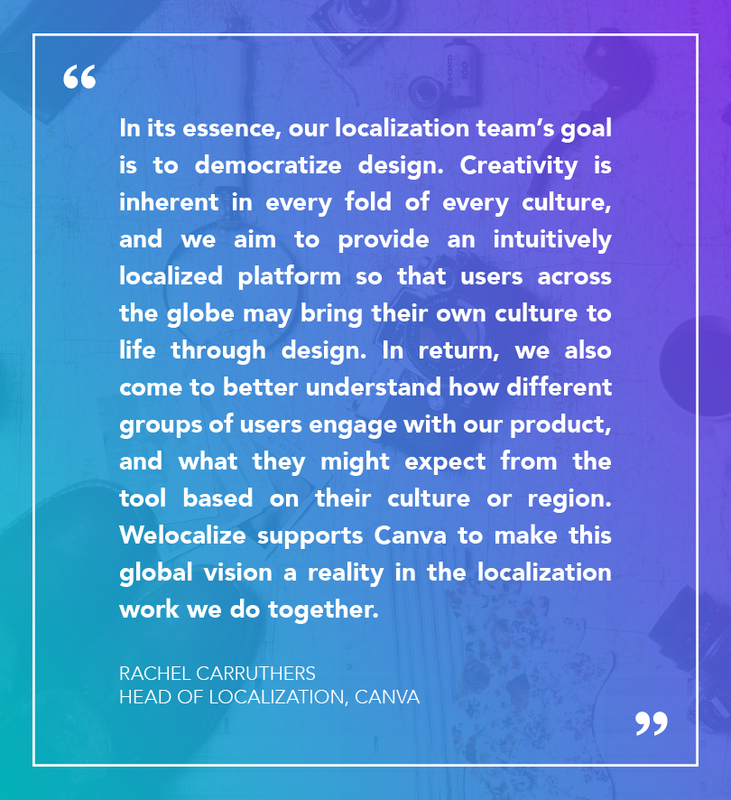 Welocalize has helped Canva launch in multiple languages in rapid succession, including over 28 lesser known languages like Sinhala, Fula, Tajik, Malagasy, and Cebuano. Sourcing translators and linguists for rare locales at short notice can be a challenge. Welocalize leverages its network of over 30,000 in-country linguists to ensure demand for all locales is met. For each locale, the program supports Canva’s web and mobile strategy, underpinned by world-class language quality assurance (LQA) for optimum UX. As a design-driven global organization, Canva strives to retain its fun, innovative brand to users whilst delivering an easy-to-use and accessible product that meets the needs of its users all over the world. A combination of translation, localization, internationalization, and transcreation is required to hit the right tone at a local level on all platforms.